Wow. It's Tuesday and I've still not recovered from my epic weekend in London. No, I don't mean hungover (for those that met me / talked to me / saw me would be surprised to know, I didn't drink!! ), I just mean tired and achy and all in all, rather pathetic! I could have got a coffee (er, helloooooo- #frugalfeb here!) so instead waited patiently for my First Class carriage to arrive! Oh yes, First Class to London for £33 you say? Thanks!! So, extra leg room, single seat and 2 cups of tea, one bottle of water, one can of diet coke and a Ham Croissant later, I was pulling into Kings Cross having been tweeting like a king! As I walked in the door I was finally able to meet the charming Caroline, and the majestic Mhairi! They were my rock for the entire 21 hours I was in London. I could not have got through the day without them! Thanks to Lauren for this photo! It fits, it highlights, it flows, it does just what you need a dress like this to do! Perfection. Other bloggers - archedeyebrow; fatsallyre; blogtobealive - have blogged about their thoughts on the collection and I can't honestly add anything further. There is still a sense of fun with her prints and her cuts, and I do think I finally need to take the plunge and order some genuine Anna (rather than concessions Anna, working with other companies). 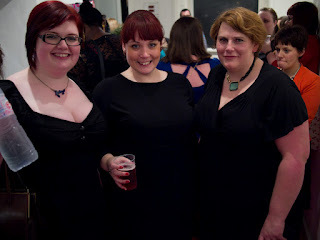 The Q&A was a lovely opportunity to discuss our gripes and our complaints, and hear what Anna and Liz had to say. As usual with the complains about the models being used, the answer is - there aren't (m)any for us to use. Also, the conversations about how + ranges are being consigned to the internet, as though they don't want us to leave the house, was certainly a passionate and insightful one. But time was pressing on, and us models had somewhere to be! As the offices were somewhere on the other side of London, we had to call the Q&A short, and leave. All the rushing around of earlier, coupled with the heat (yes HEAT) of the tube etc meant I was a little under the weather when we arrived at the office - not helped by the lack of food / drink since the 1st Class Experience. My mood was lifted by water and the promise of pretty clothes to try on. Ummmmmm. Well, once photos emerge of said clothes, I'll let you decide. After a rush to get to the hotel in Paddington (from Parsons Green), then back to The Strand at Embankment - losing my ticket along the way - Mhairi and Caroline really did keep me sane! Arriving a little late due to the snow, we were rushed into the tiny room. I wasn't given my clothes, I had to find them. We didn't know what order we were walking in, it was 'Who ever is ready'. We had a carpet with every chance of tripping up over. We hadn't practiced the 'posing', or the 'twirling'. Thankfully the likes of Boombands Em and Caroline's cheering made up for what could have been a rather silent reaction. 8pm and the 'audience' had arrived. I felt like putting a disclaimer out saying we hadn't chosen our own clothes, when really, it was quite clear we hadn't. Catwalk over, and it was time to get changed again, back into the swing of the party (please note I'm glossing over the catwalk experience for a reason. Please see this post: Open Letter. The outfit: now the rubbish blogger that I am, I had forgotten my camera, and was too busy talking to people to take photos at any point during the event. All the credit for this stunning photo goes to Claire (Chief Organising wonder) and her wonderful husband Rob! 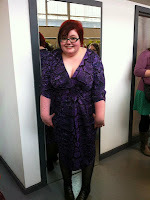 The dress is the Collectif dress, and the bra is Ewa Michelik. I love her. They got a lot of attention through the night, and I honestly can't wait until more pictures emerge! I talked to many, introduced myself to some, and generally had a BLAST! 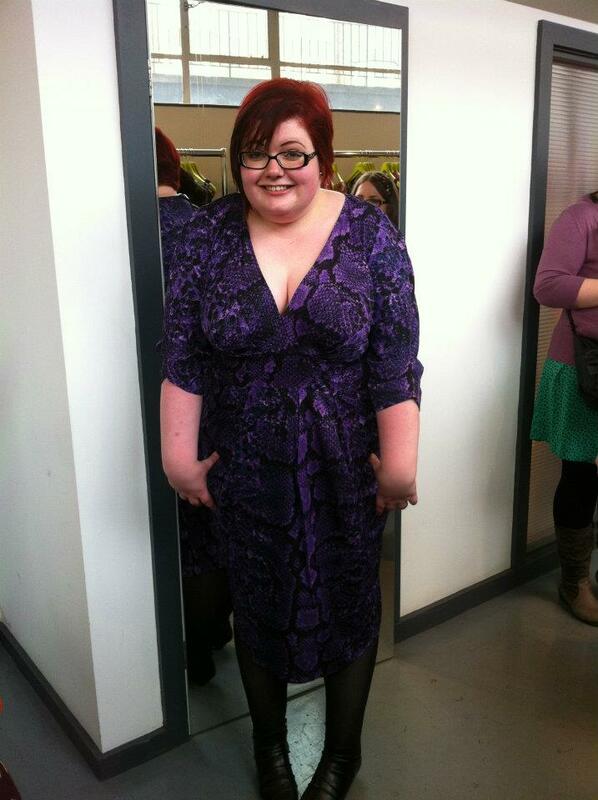 I got fitted by Elomi (I had the right sized bra on - but she wanted to check and make sure - very thorough!) and I'm now wearing my free full cupped black bra. Now, it's not to my taste, but sometimes a girl needs a full cup. Red Bows boutique (a +size vintage specialist) had some stunning pieces, but as I was in the middle of #frugalfebruary, it had to be a no. The pop up photo studio was a great addition, and the cupcakes (my only sustenance for the entire night) were to die for! Thank you Wendy Cakes! The event was great fun, but travel weary and model exhausted (with out the help of the class A drugs, I don't know how they do it! ), Mhairi and I were tired, hungry, and hyper at the same time! Off we toddled in the snow to get the tube back to Paddington, in the hope that we found somewhere to eat. SUCCESS! A lovely Italian Roast Dinner awaited us in the restaurant right next to the hotel. Full on roast beef, and excited by the day we had had, we tried on each others clothes, and chatted to the wee small hours. Thank you once again to Claire and her team of willing helpers - it was a great success. No sour taste left. Which just shows what an amazing event it was. It meant I could meet some women I'm in awe of, in love with, and in lust over. And some are all three! Main thing was the people I met. Bethany, Danni, Lauren, Sally, Mhairi, Caroline, Sara & Sarah (amongst others). So much fun....and I have SERIOUS cleavage envy - I meant to tell you that after you'd changed into your frock. Awwww Sally, so sweet! Just what Mama gave me... and a bloody good bra! It does take practice!! How does the bra feel? Better I hope? The main reason I'm sticking with #frugalfeb is because I really want that Cath Kidston handbag!! Was lovely chatting with you too - can't wait for next years!